Seventy-three of the 92 sites at the well-appointed campground on a bluff above Salt Creek Recreation Area, near Port Angles, have views of the Strait of Juan de Fuca. Enjoy miles of sea-stack-festooned beach bisected by Salt Creek (where kids will love to splash around) and Tongue Point, where tide-pool aficionados can get up close with ochre starfish, purple sea urchins, green anemones and gooseneck barnacles. Need To Know: Half the Clallam County–managed sites are first come, first served; the rest can be reserved in advance via the park’s website. Pay showers available. $22‒$30/night. Camp at Kalaloch Campground on the wild and woolly Olympic Peninsula coast and you’ll have miles of driftwood-festooned beach and all the misty ambiance you could ever hope to drink in. Need To Know: Kalaloch is only one of two campgrounds in Olympic National Park that accepts advance reservations, so those who like to plan ahead won’t have to make a mad dash to get there on Friday morning and hope for a site; the remaining 22 of its 170 sites are first come, first served. No showers. $22‒$44/night. GET OUT: Hiking in Moran State Park. Photo courtesy of Washington State Parks. 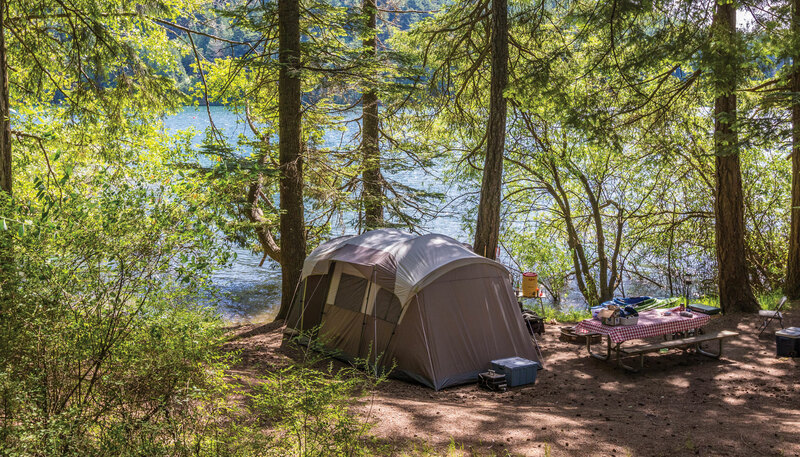 Mountain Lake campground—the most remote of four excellent lakeside campgrounds in Moran State Park on Orcas Island in the San Juans—is halfway between the sky and ocean, and an idyllic place to spend a few nights in between hiking, swimming or canoeing. Need To Know: Reservations are required during the summer for any of Mountain Lake’s 18 campsites or the other 133 sites in this Washington state park. Pay showers available. Basic campsite $30/night. Paddle off under your own power with a kayak loaded with food and camping supplies—destination Jones Island, an uninhabited 188-acre gem in the middle of the San Juans, just a 6-mile paddle from Friday Harbor. Need To Know: All of this marine state park’s 24 campsites and are first come, first served, so get out early. Bring your own kayak if you own one, or plan to rent one from an outfitter in Friday Harbor. No showers. $12/night. Many of the sites at White River Campground, the lesser known (and highest in elevation) of the three drive-in campgrounds within Mount Rainier National Park, boast not only river frontage but boss views of snow peaks through the towering evergreens as well. A quick drive (or long hike) up to Sunrise yields access to an alpine wildflower wonderland in July and August. Need To Know: The 112 sites in this National Park Service campground are all first come, first served. No showers. $20/night. A short jaunt alongside the Chain Lakes Trail offers the best backcountry experience without having to hike too far in. Depart from Artist Point between Mount Baker and Mount Shuksan, and follow this epic alpine trail along snowy ridges and through evergreen dales to your choice of campsites along any of three pristine mountain lakes. Need To Know: Camping is free but primitive; you’ll need to pack in (and out) everything you’ll need. A Northwest Forest Pass is required to park overnight at Artist Point (or at any trailheads or parking lots within the Mount Baker–Snoqualmie National Forest). No showers. Located just outside of Leavenworth, Eightmile Campground fronts Icicle Creek, a playground for river recreation of all stripes (tubers, rafters, kayakers). Go ahead, stick your nose into the bark of that ponderosa pine—a species whose sweet sap smells like vanilla; the tree is common in the high, dry forests on the east side of the Cascades. Need To Know: You can reserve 26 of this Okanogan-Wenatchee National Forest campground’s 45 sites in advance, while the remaining 19 are available first come, first served. No showers. $22‒$44/night. With five sites permanently reserved for those arriving by bicycle—and with the whole island of Whidbey and the mainland north country at your two-wheeled disposal—you won’t find a better base camp than Deception Pass State Park. After your ride, cool down with a dip in the ocean or a full-on swim in freshwater Cranberry Lake. Need To Know: Besides the five biker/hiker sites, this most visited of Washington’s state parks offers as many as 306 other campsites (172 for tents only, and 134 that can accommodate RVs) across its three campgrounds. Reserve a spot online or by phone (888.226.7688). Pay showers available. $12‒$45. If you like the convenience of car camping but hate the crowds, blaze your own trail in a “cowboy” campsite in any of Washington’s abundant, publicly owned (that’s you and me) national forestlands. Just don’t go if you can’t change a tire or cook a backcountry meal for yourself. National Forest Road 3040 off State Route 542 in the Mount Baker–Snoqualmie National Forest offers some excellent out-of-the-way sites. Need To Know: A Northwest Forest Pass is required to park within the national forest. If your idea of experiencing nature is seeing wildlife, the Hoh Campground, near the entrance to the Hoh Rain Forest in Olympic National Park, might fit the bill, given that campers often must share their riverside campsites with a rambling herd of majestic Roosevelt elk. Need To Know: This national park campground has 78 sites, all first come, first served. No showers. $20/night. —Langdon Cook, foraging expert and Seattle magazine columnist. His latest book is Upstream: Searching for Wild Salmon, from River to Table.